Citizenship is a core concept for the social sciences, and citizenship is also frequently interpreted, challenged and contested in different political arenas. 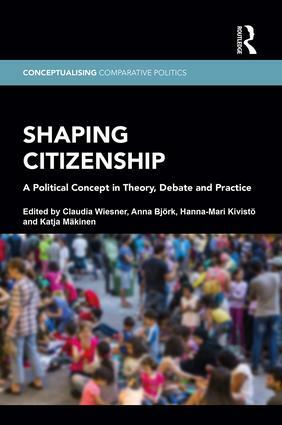 Shaping Citizenship explores how the concept is debated and contested, defined and redefined, used and constructed by different agents, at different times, and with regard to both theory and practice. The book uses a reflexive and constructivist perspective on the concept of citizenship that draws on the theory and methodology of conceptual history. This approach enables a panorama of politically important readings on citizenship that provide an interdisciplinary perspective and help to transcend narrow and simplified views on citizenship. The three parts of the book focus respectively on theories, debates and practices of citizenship. In the chapters, constructions and struggles related to citizenship are approached by experts from different fields. Thematically the chapters focus on political representation, migration, internationalization, sub-and transnationalization as well as the Europeanisation of citizenship. An indispensable read to scholars and students, Shaping Citizenship presents new ways to study the conceptual changes, struggles and debates related to core dimensions of this ever-evolving concept. Claudia Wiesner is acting professor for comparative politics at Hamburg University and adjunct professor for political science at the University of Jyväskylä. Anna Björk is a postdoctoral researcher in political science at the Department of Social Sciences and Philosophy, University of Jyväskylä. Hanna-Mari Kivistö is a postdoctoral researcher in political science at the Department of Social Sciences and Philosophy, University of Jyväskylä. Katja Mäkinen is a postdoctoral researcher at the Department of Music, Art and Culture Studies, University of Jyväskylä. Conceptualising Comparative Politics: People, Polities, and Markets seeks to bring a distinctive approach to comparative politics by rediscovering the discipline’s rich conceptual tradition and inter-disciplinary foundations. It aims to fill out the conceptual framework on which the rest of the subfield draws but to which books only sporadically contribute, and to complement theoretical and conceptual analysis by applying it to deeply explored case studies. The series publishes books that make serious inquiry into fundamental concepts in comparative politics (crisis, legitimacy, credibility, representation, institutions, civil society, reconciliation) through theoretically engaging and empirical deep analysis.